Welcome to another random notes blog about money, musicians, senior discounts, lawyers, guns, and, well, still more money. According to Wikipedia, the US has been the wealthiest country in the world for a long while. In 2015 it had a net national wealth of $85.9 trillion dollars. Below it are China ($22.8 trillion), Japan ($19.8 trillion), the UK ($15.6 trillion), and France ($12.7 trillion). Artist's depiction of U.S. wealth inequality in 2013. Graphic by Stephen Ewen. Licensed by CC By-SA 3.0. This disparity between Upper and Lower America may not seem that bad from these statistics—after all, even the lower 80% are richer than most of the world and are on a par with the UK and France. However, if I consider the plight of the lower 40% then I'm looking at only 0.2% of the wealth of the US, or $171.8 billion. This is a quarter of the wealth of Greece. It's hard to get more specific about wealth because most numbers are expressed as either gross domestic product or wealth per capita, but suffice it to say that a country worth only $171.8 billion isn't worth much. If I consider my take-home pay relative to my productivity, it looks like my salary rewarded my productivity proportionately from the end of World War 2 up to 1975. When men came home from the war, women's places in the labor market suddenly disappeared, and it would take decades for them to win back that progress. Men became the exclusive breadwinners in most families, yet they were able to buy a house, a car, a television, and support their wives and average 2.2 children. The GI Bill gave most of them a financial boost. But since 1975, women have not only won their places back in the labor force, but they have been left little choice but to work—one wonders if all the women's rights talk from the 1970s onward were merely a polite way of saying "Get to work!" 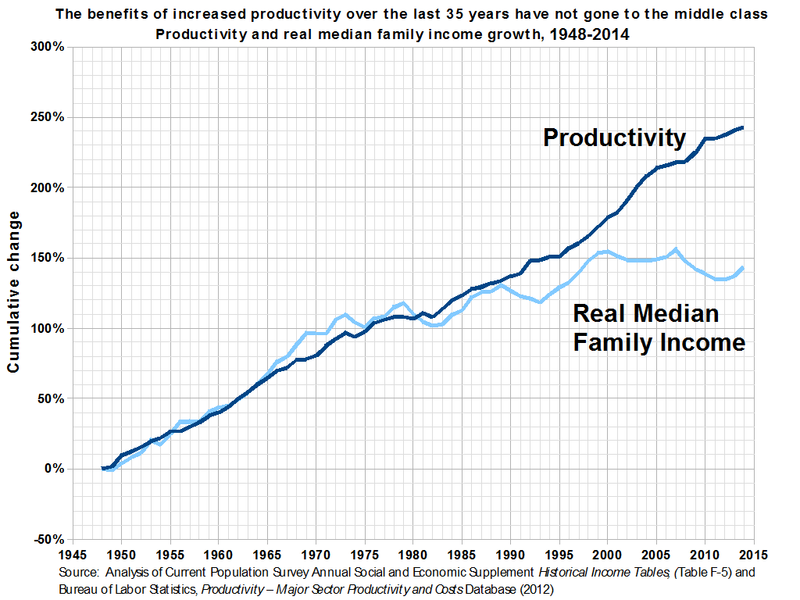 Since that time productivity has more than doubled, yet the real median family income has stayed more or less the same. So all the money made from this increase on productivity goes to someone other than the people who were productive. WHAT DO MUSICIANS TALK ABOUT WHEN THEY'RE PLAYING? I often see musicians in mid-song quickly exchanging a few words. I hear the Beatles talking low in the mix, particularly in the endless repeating refrain at the end of the song. And I've noticed this among sitar players like Anoushka Shankar and her percussionist. What do the sitar player and the tabla player talk about while they are playing music? I don't have the answer to this question, but surely there is a musician who can tell me what's going on. Are they making last-minute changes to the arrangement? Are they talking about the gate? Are they just making show? McMinn County Senior Citizen Center, completed in 1998. Designed by Joseph S. Goodstein. Photo by Ghbeeri. Licensed under the Creative Commons Attribution-Share Alike 4.0 International license. When I became 60 I began to enjoy senior discounts at various places. Actually some places offer senior discounts to people as young as 55, but I didn't even think about the possibility until I turned 60. So that's what it's all about. We work and slave, scrimp and save our lives away, and shops and especially restaurants start offering me senior discounts to soak up those pensions and social security benefits. Yes, after all these years, senior discounts have finally given my life meaning. I went to a huge, bulimic-sized Chinese buffet on my birthday to celebrate this new discount in my life, but it turned out that because i was there in mid-afternoon, I was also eligible for the early-bird discount, which was significantly more than the senior discount. What I've learned about the Chinese buffets is that it's much better to go to the Korean Japanese restaurant where the emphasis is on quality over quantity instead of vice versa. Senior Citizen Fair at Seattle Center, 1973. Photo by Seattle Municipal Archives. Licensed under the Creative Commons Attribution 2.0 Generic license. There are many Web sites that direct you to businesses offering senior discounts, among them Senior Discounts seems to be the biggest. You should keep in mind that this apparent kindness doesn't reach all the way to the bone. Senior discounts are offered because the shop or restaurant somehow calculates that in the long run they are going to make more money, not less, by offering the discount. I suppose some few feel that they are doing a service to the community, but even they wind up with a lot of regular customers, but if everyone is happy, then that's great. I wouldn't mind a diner where I liked the food and who gave me a 20% discount just because they want a regular customer who finally knows better than I did fifty years ago. I'm just urging anyone to proceed with caution—caveat emptor. The queen of senior discounts is the US government's Senior Pass for recreational areas. It covers entrance fees at 2,000 federal recreation sites including national parks and national wildlife refuges as well as standard amenity fees (day use fees) at national forests and grasslands, and at lands managed by the Bureau of Land Management, Bureau of Reclamation and U.S. Army Corps of Engineers, and it usually gets you discounts on other fees as well. The areas include not only what we're accustomed to thinking of as recreational areas—the National Park Service and the USDA Forest Service—but also the Bureau of Land Management, the Bureau of Reclamation, the Fish and Wildlife Service, and the US Army Corps of Engineers, which is an important one because they are the great builders of dams like the Hoover Dam. Web pages concerning the pass are likewise scattered across the sites of multiple agencies, and none of them are completely clear, but if you're going to enter a federal park more than once during the rest of your life, the Senior Pass is a good investment. 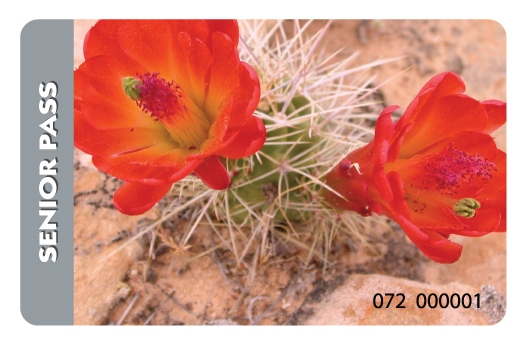 You can buy the card at a park entrance, for which you must prove that you are a US citizen or permanent resident 62 years of age or older. Proof includes a driver's license from a US state or territory, a passport, or a permanent resident card. The Senior Pass costs $10 if you buy it at the park gate, but if you prefer to have all your ducks in a row before you get there, pay $20 to get the pass by mail. The multi-agency Senior Pass replaces the Golden Age Passport. People who have paper versions of the Golden Age Passport or Golden Access Passport may exchange them for the respective new Interagency Recreation Passes free of charge, but they can't exchange the plastic versions yet because "currently hundreds of thousands of these passports [are] in circulation and the agencies cannot accommodate a full exchange program." Absolutely unnecessary and destructive in cities, and perhaps a necessary evil in rural settings. More die in cars than in wars. They're ruining the planet. Every time I put my foot on a gas-burning accelerator I am fracking. Cars are noisy, dirty, and expensive. They dictate inhumane architectural design and urban planning paradigms. In the typical person's budget, they are the biggest expense except for housing. They're the worst possible solution for everyone's daily commute. In the US, where I have a knee-jerk reaction against anything public because socialism is automatically considered evil and a discussion stopper, I fail to realize that cars are the most socialized form of transportation anywhere because they depend upon roads that are PUBLIC WORKS.... OK, I'll get off my soapbox though I have so much to say about this. I've traveled around the world and seen the huge difference between urban settings developed for cars as opposed to those developed for pedestrians. Personally I think that the lack of choice in this election is a grand opportunity for the citizenry to realize how differences among candidates are superficial and insignificant, which gives them a chance to come to terms with the corporate dictatorship. And if you come to terms with the corporate dictatorships grotesquely putrid moral core, then we can start dealing with issues like how the major supplier of drugs in this country is the CIA at the top of the dealing pyramid, or that most wars are for either drugs or petroleum and that 58,000 boys died in Vietnam defending the opium supply (raw product to make heroin), or that in order to preserve its business in Latin America the US has unleashed demonic gangs that have turned every country from Mexico to the Andes into a paradise for demonic gangs whose rein of terror has a huge death toll.... But one crook or another will get elected here in the US, and I can only hope that their crookedness becomes so obvious that people finally realize how naive it is to think America's deep corruption can be fixed at the ballot box.